The Settings tab lets you change the directionality and timings for each control. Stick and DPad controls can be configured with axis-style, 4-way, 8-way directions. 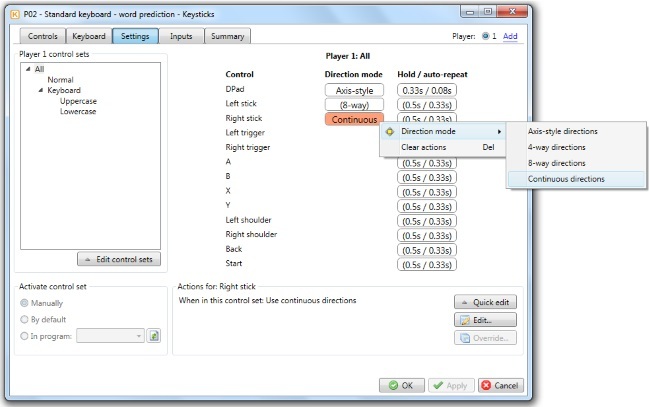 Stick controls also support continuous directions for controlling the mouse pointer. 4-way means the control will be used to select one of four directions: Up, Down, Left and Right (i.e. four independent directions). 8-way directions means the four diagonal directions are also allowed (i.e. eight independent directions). Axis-style means that you specify actions for Up, Down, Left and Right, and Keysticks automatically performs combinations of these for the diagonal directions e.g. directing the control up-left will do the actions assigned to Up and Left together. Axis-style is useful for controlling the arrow keys or movement controls (e.g. WASD). Continuous mode is used for controlling the mouse pointer with a stick control. The "Hold / auto-repeat" settings replicate how a standard keyboard works: when you hold down a key, one key press occurs, then there is a delay, then key presses are repeated rapidly. Similarly, in Keysticks, the hold time defines when a long press is deemed to have occurred and when to start any auto-repeating actions. The auto-repeat interval defines how often the repeating actions are performed.